Stop by the protein powder section in virtually any health food store, and you're likely to find a variety of whey protein options. And while you don't need protein supplements for good health -- even if you're trying to change your weight -- adding whey protein to your diet can help you reach your goals. Whey doesn't have to make you gain weight; in fact, it offers some benefits for weight loss diets, but it can help you gain mass if that's your fitness goal. Changing your weight requires adjusting the number of calories you eat, not just adding whey protein to your daily diet. For example, if you eat 250 to 500 calories more than you burn each day, you'll gain weight at a safe rate of 0.5 to 1 pound weekly. On the other hand, reducing your intake to 500 to 1,000 calories less than you burn daily will allow you to lose weight -- 1 to 2 pounds each week. Whey protein serves as a source of calories, so you can use it to get the extra calories needed for weight gain. On the other hand, you can budget the calories in whey into a restricted-calorie diet, which will allow you to lose weight. How many calories you'll find in a serving of whey depends on the type you choose; one commercially available whey shake has just 113 calories per serving, while another commercial whey supplement has 309 calories. If you're trying to add more calories and gain weight, go for a higher-calorie supplement; if you're trying to lose weight, opt for a lower-calorie one. If you're trying to avoid weight gain, including whey in your diet might help. Whey might help you to stick to a calorie-controlled diet. A preliminary animal study, published in Obesity in 2011, found that rats who were fed a whey supplement ate significantly less food that rats who were fed soy protein. Over the course of the 10-week experiment, the whey-fed rats also lost more body weight than the rats who didn't eat whey. While animal studies don't always mimic the effects seen in people, these results hint that taking whey might control your appetite, so you can eat fewer calories and shed pounds. Whey has demonstrated fat loss benefits in people, too. A study published in Nutrition and Metabolism in 2008 found that obese people who drank a whey-based protein shake lost more body fat than subjects who drank a whey-free shake, even though both groups followed similar diets. The whey protein group also held on to more muscle over the 12-week study period -- losing just 2 pounds of muscle, compared to 5 pounds for the non-whey group. Retaining muscle is important for long-term weight management; because muscle is more metabolically active than fat, having more lean muscle tissue increases your calorie burn throughout the day, boosting your metabolism to keep off the weight. Whey protein, consumed as part of a weight gain diet, can also help you pack on pounds. 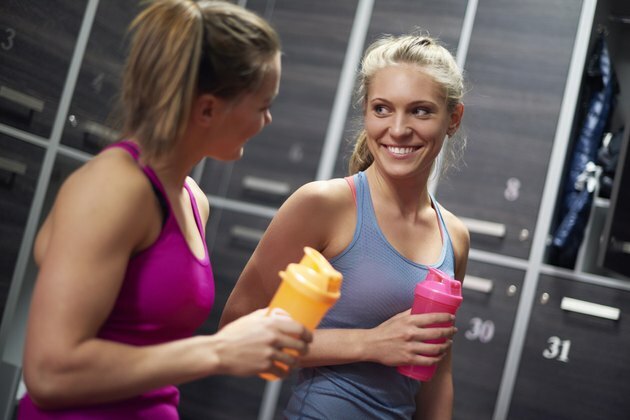 Simply adding a whey protein shake to your typical diet can promote weight gain. If you drink the 309-calorie whey protein shake on top of what you'd need to maintain your weight, you would gain weight at a rate of slightly more than a half-pound per week. Adding whey to your routine might also help you bulk up and add lean muscle to your frame, as long as you pair it with strength training exercises. Whey serves as an ideal source of protein for post-workout recovery, according to a review published in the Journal of the International Society of Sports Nutrition in 2012, due to its high protein quality and bioavailablity. That means taking a whey shake after a tough strength workout provides nutrients you need to support muscle growth so you can add lean mass to your frame. For the best results, check the nutrition label on your whey supplement to look at the amino acid breakdown; each serving should provide 3 grams of leucine for muscle-building benefits. Check with your doctor before changing your diet or introducing whey into your routine; if you need to gain weight due to a medical condition, like kidney disease, taking a protein supplement might pose a health risk. Once you have medical clearance to take whey protein, adjust how you serve it to make it work for weight gain or loss. If you're trying to shed pounds, for example, simply mix a low-calorie whey protein powder with water and a handful of fruit for a shake that's not too calorie-dense. A 113-calorie powder made with water and blended with a cup of strawberries, for example, contains just 166 calories. If you're aiming for weight gain, on the other hand, you could blend a higher-calorie whey powder with whole milk, 2 cups of berries, and add a tablespoon of almond butter for a 662-calorie shake. How you customize your shake is up to you. You could use different fruits, add leafy green vegetables or use liquids like almond milk, green tea or juice instead of milk or water; just count the calories in your whey shake and pair it with a diet to meet your daily calorie target to gain or lose weight.